We could not have asked for better conditions to start Day 2 of the UNSW Sunsprint Challenge. Bright sunshine and a cloudless sky meant all participants would get to see how just how good their cars could be after yesterday’s frustration. The first session was devoted to completing the time trial events from yesterday. Our teams had mixed success with a variety of wins and losses throughout the session putting us on a collision course with some of the better teams in the knockout racing. It was wonderful to see the girls looking at the performance of their car in that first session and making decisions on gearing and wiring. The learning gained from watching not only their car but also the better cars will help them when they take on the Challenge in 2019. The knockout races were limited to one race, winner takes all. We had two teams in Round 1 and both moved through to Round 2 and that is where our campaign ended. All teams were eliminated in close races that gives us a lot of encouragement for the future. A big thank you to all team members for the effort they have put into this year’s Challenge. Most have now had two years experience and will be looking to be serious challengers in 2019. Thanks also to the parents who came along to support the teams. Your encouragement and enthusiasm over the two days was greatly appreciated. We arrived at UNSW this morning with high hopes for a great day of solar car racing. Initially the weather was quite promising with bright light and the odd patch of sunshine but this quickly disappeared to be replaced with heavy cloud and intermittent showers. Not ideal for racing solar cars. Teams from all schools struggled in the conditions with not one car making it around the 100 metre track. The best any of our cars could manage was to crawl to the halfway point. In progressing this far around the track we were able to record some wins in the Time Trial event. This should put us in a good position for the racing tomorrow. The day was not a total loss as the girls got the chance to look at how some schools had interpreted the regulations with some very innovative designs. The use of laser cutters was very evident with a number of schools using the technology to produce some innovative designs. It is something we hope to have regular access to before the 2019 Sunsprint! Our teams spent most of the day modifying their designs and fiddling with gearing to try and get the most out of the limited light available. They may not realise it yet but the learning from today will be of great benefit if we get ideal conditions tomorrow. After a number of weeks preparing for the 2018 UNSW Sunsprint Challenge our four teams are ready to race! Tomorrow will be Day 1 of the 2018 event and it will be about testing and trials. On Day 1 all teams get to see if their designs are equipped to handle the 100m track. Each team meets with the ‘judging committee’ to make sure their cars meet the guidelines for the competition. Day 1 is very much about testing and evaluating. Teams need to work together to make important decisions about how they modify their design to be competitive. Getting the gearing ratio correct is vital and each team needs to test how their car performs with both high and low gears and map that data to the amount of sunlight available. The team that does this best will find them in the championship races on Saturday afternoon. Our four teams are participating in their second Sunsprint so are well aware fo what they need to do to be competitive. We look forward to sharing the successes and failures over the next two days. It is important to remember that the failures are often more important than the successes in terms of understanding how to improve the performance of each car. Our four teams are at various stages of construction as we are now only two weeks away from this year’s Challenge. With all teams having been part of the 2017 Challenge there is less panic as we are all aware of what needs to be done prior to the event. One team is well advanced and their car is taking shape nicely. 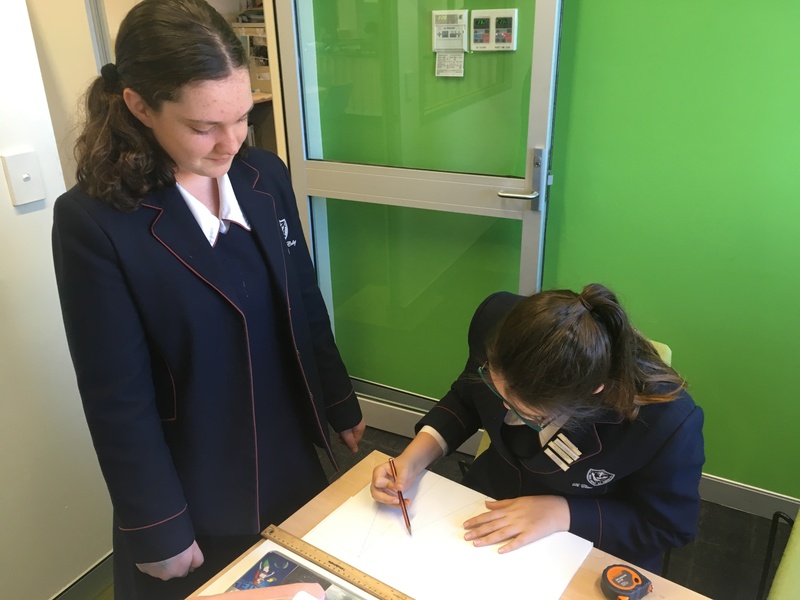 Isabella Tole and Liz Nikitenko have been meticulous in their planning and the end result will be a very competitive car. We also took the opportunity to have some of our team members appear on STC BTN for this week’s episode to talk about their involvement in the Challenge. Construction of our cars for this year’s Challenge is underway following a late start to the project. Quite a number of our team members were involved in last term’s App Developer program which meant little time was able to be devoted to thinking about Sunsprint. Fortunately most team members participated in last year’s Challenge and had a clear idea of what they wanted this year’s design to include. Once we had our head around the regulations coming up with a design was quite straight forward. Last year the focus was on a simple design using balsa. This enabled the teams to be competitive and ensure we were able to participate throughout both days. This year the emphasis is on speed and weight. This is typical of involvement in the Challenge. All teams go through this development phase and it is only when you have taken part do you realise the possible design options that exist. The Challenge takes place in a little over three weeks at UNSW. We look forward to sharing the development of our cars and seeing what amazing designs our girls can come up with. Day 2 of the UNSW Sunsprint Challenge took place in perfect conditions. Clear blue skies and bright sunshine meant we could look forward to a great day of racing. The Village Green was packed as three events were held simultaneously. The Mini-Sprint for the Primary schools, the Solar Boats and Sunsprint attracted big crowds. We continued the day with two more rounds of racing before heading into the knockout rounds. One of the big changes to the event was the minimal time needed for scrutineering and this resulted in more racing. A much better format for the students. At the end of the round racing a number of teams from both St Clare’s and Cathedral realised the solar maximisers were not efficient given only one solar panel of power was being produced. All teams decided to pull the maximisers before the knockout rounds and increase the gearing ratio. It was amazing to see students who had no idea about power output and gearing ratios last week suddenly discussing the best gearing options for their cars. The collaboration between teams across both Colleges and the learning that took place over the two days was simply amazing. If only we could bring this back to the classroom! The Knockout rounds brought disappointment for a number of teams. 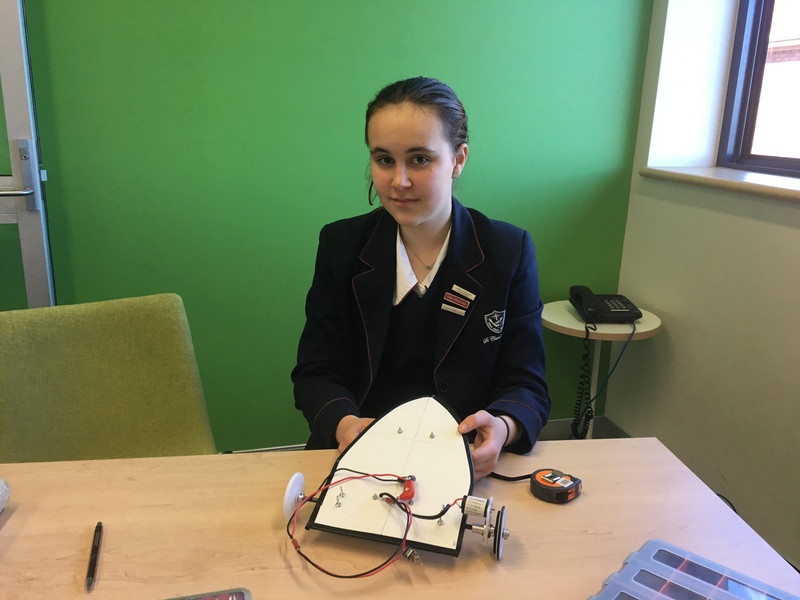 Of the St Clare’s teams only ‘Chicken Rocket’ made it through to Round 2 while a couple of the Cathedral teams progressed to Round 3, just missing the top 8. Overall it was a fabulous two days of fun and learning and we all are looking forward to being back with faster cars in 2018. Day 1 of the UNSW Sunsprint Challenge kicked off under a magnificent blue sky on the beautiful UNSW Village Green. A new venue and a new format greeted a large number of schools from around the state. The 31 cars participating were a wide variety of shapes and sizes with each team putting their own interpretation on this year’s regulations. The move to a single solar panel was the biggest change to previous challenges. As solar panels have become more advanced it was getting increasingly difficult to keep cars on the track unless large amounts of ballast were in place. The organisers provided the panels, which in itself presented a challenge around the logistics of 31 cars wanting to practice at the same time. Despite this the teams were able to juggle the process quite well and we managed to get through quite a number of races throughout the day. 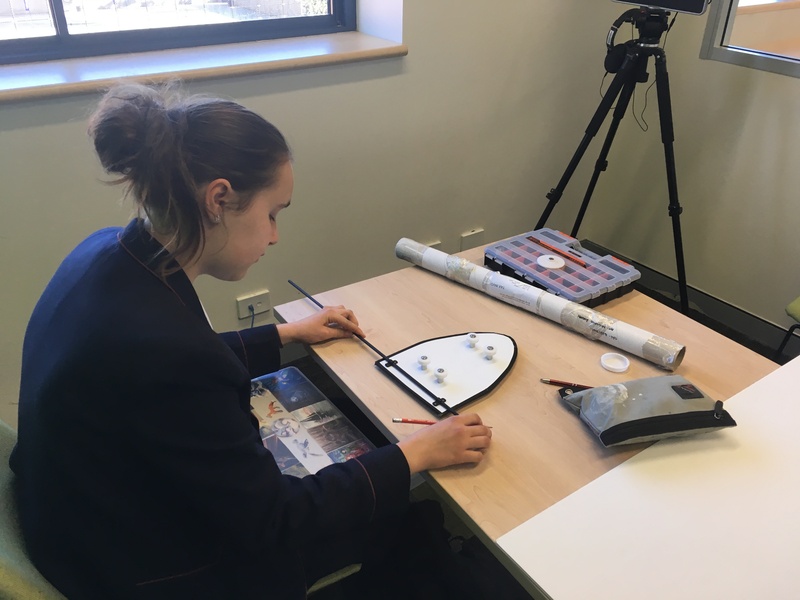 For both the St Clare’s and Cathedral teams Friday was a valuable day of practice and development as all teams were able to work on their cars and adjust gearing to suit the track and conditions. At the end of Day 1 the St Clare’s and Cathedral teams had been successful in most of their races due to the fact they were able to adapt to the new system quickly. This was helped enormously through the presence of Michael Salem who worked tirelessly throughout the day ensuring teams from both Colleges were wired correctly and ready to race. His mentoring of the younger students throughout his time at Cathedral has been an inspiration.